Kerala has 180 million coconut trees. The coconuts need to be plucked every 45 days and at least 50,000 tree climbers are required for this, according to the state’s Economics and Statistical Department data. But there is an acute shortage of labourers skilled in the task. Because of this most of the coconuts dry up on the trees and fall, either to go waste or be pilfered. An initiative started by the Coconut Development Board (CDB) in Kochi is, however, slowly changing the scenario. Under the Friends of Coconut Trees (FoCT) programme, started in August last year, 7,000 people have been trained to work as coconut tree climbers. The board organises six-day workshops across the state to train people and familiarise them with all aspects of coconut cultivation. Healthy men and women between 18 to 40 years and educated up to seventh standard can enroll for the workshops. “The idea is to groom workers and provide them an all-round knowledge of coconut cultivation and make the work socially respectable,” says T K Jose, chairperson of CDB. Kerala has suffered from paucity of local agricultural labourers since long. As with many other traditional employments, it was the members of a particular community who took to coconut plucking. They would take up the risky task of climbing up 50 to 60 feet everyday but were considered low caste and suffered discrimination. Better education facilities prompted most of them to give up the profession. A dearth of coconut pluckers meant irregular harvesting and poor health and productivity of the trees. Frequent pest infestations, price fluctuations and restrictions on coconut export in the country kept the fortunes of coconut farmers in doldrums. CDB initiative has come to their rescue. “Getting someone to pluck coconuts had always been an issue. Now it is only a matter of a phone call,” says K Jinachandran, a coconut farmer in Kaipamangalam village of Thrissur. 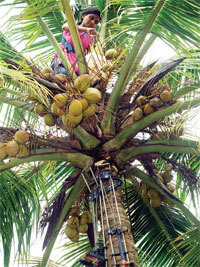 The programme does more than train workers to climb up coconut trees. Binoy Vargese of Vadakkancherry in Thrissur scales 40-50 trees every day and earns Rs 15 per tree. “FoCT training changed my life,” he says. The programme has, however, attracted lesser women than men. “We had aimed at having at least 30 per cent women trainees but only 440 women enrolled in the first year,” says Mathew. What’s worse, attrition rate is high among women climbers. Only 60 to 65 per cent of them stick to the profession for long. Suja T of Kollam district says she does not find the remuneration attractive enough for the strenuous work. But there also are some very active women climbers like Suni, a mother of two from Thiruvananthapuram district. She started of as a trainee but is now a trainer herself. The success of the initiative has attracted the attention of neighbouring states Karnataka, Tamil Nadu, Andhra Pradesh, Maharashtra and Goa. Workshops are on in these states with a target of training another 5,000 people. Other coconut growing countries have also shown interest in the programme. The board has signed an MOU with the Republic of Trinidad & Tobago in May 2012 for coconut seed supply, technology transfer and training manpower. Similar requests have also been made by Kenya and Mozambique, says Jose. A good initiative from the part of CDB. This movement actually deserves appreciation. This movement will give more opporunities for rural poor and clears the problem of acute shortage of coconut pluckers.